Precise color matching to our customer's needs and requirements is accomplished with computer technology. 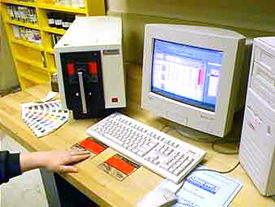 Instrumentation and measurement by colormatching equipment feeds exact analysis data into the computer system for duplication of color to the right angstrom! Call or email us today for a quote on orders of any size. Our designers are available to discuss all aspects of your “Touch Product” needs.